Hermann Haller, M.D., became the institution’s second fulltime president in July 2018, succeeding Kevin Strange, Ph.D., who oversaw a significant expansion of the institution’s research and educational programs during his nine-year tenure. Haller received his medical degree from the Free University of Berlin and completed his postdoctoral work at Yale University. He has published more than 700 peer-reviewed articles, holds six world-wide patents and has founded four biotech companies. He has received many honors and awards and serves on numerous advisory boards, including those of Bayer, Boehringer Ingelheim, Genzyme and Novo Nordisk. 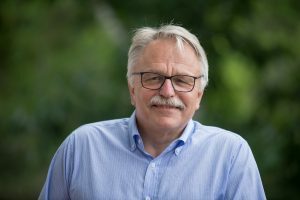 In addition to his position at the MDI Biological Laboratory, he is also a full professor and chairman of the Division of Nephrology at the Hannover Medical School in Germany. Haller has been a faculty member at the MDI Biological Laboratory since 2007 and a visiting scientist at the institution for more than 20 years. His research focuses on the pathophysiology of proteinuria, the mechanism whereby the capillary wall in the renal glomerulus is altered, allowing albumin and other molecules to cross the multi-layered membrane. An understanding of proteinuria, which is the hallmark of acute and chronic kidney damage, is not only of pathophysiologic interest, but may also lead to the identification of novel molecules that can serve as therapeutic targets or diagnostic tools in the treatment of chronic kidney disease. Chronic kidney disease affects 30 million in the United States. Without treatment, the kidneys may fail, in which case patients must undergo dialysis, in which a machine is used to rid the blood of harmful waste, or transplantation. The disease represents a huge — and growing — health care burden, costing about $42 billion per year in Medicare expenses alone. Because the most common causes are diabetes, heart disease and hypertension, all of which are increasing as the U.S. population ages, the disease is a major public health issue among those age 60 and over. It also presents a diagnostic challenge since there are typically no symptoms in the early stages. While kidney disease can be treated with dialysis and transplantation, the dream is kidney regeneration. In his research at the MDI Biological Laboratory and in Germany, Haller is seeking to understand the molecular mechanisms underlying kidney regeneration in animals such as the zebrafish that can regenerate organs. He is using this knowledge to manipulate stem cells for the purpose of regenerating kidneys in humans. Haller’s research reflects the current focus of the 120-year-old institution on regenerative medicine and aging, as well as its historical focus on kidney physiology, a field in which it is renowned for its contributions.